We're still in an experimental mood even after our breakfast experience. We decide to dip our toes in at Della Nonna. 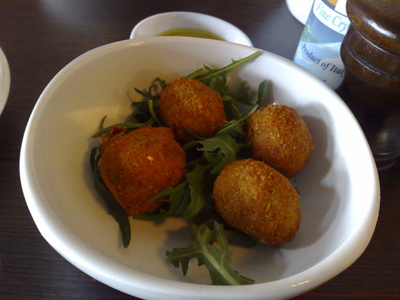 Della Nonna is a world away from it's previous incarnation as the Courtyard Deli. It certainly looks like the new owners basically gutted the place and have moved it from the 1970's to become a stylish modern cafe - complete with wood burning pizza oven. hot, crisp, salty, meaty - they tick the boxes to get your appetite going. 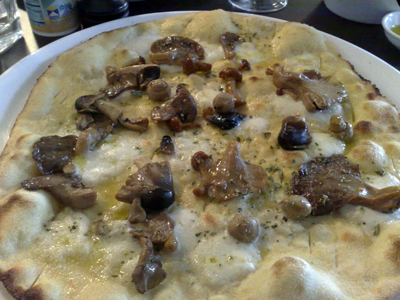 I order the Pizza Bianco - white pizza with mushrooms. 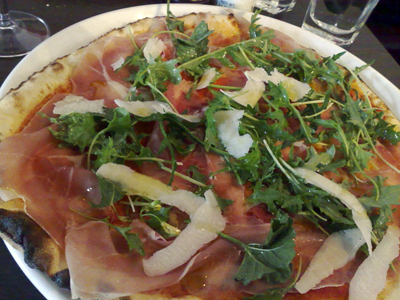 We are pretty impressed with both pizzas - the bases are lovely and thin, perfect for folding and certainly do remind up of those we enjoyed in Italy. Hi Guys just wanted to say hello, and to let you know that i now work at les boucheries on Toorak road south yarra. I would love for you guys to come in for dinner one night our food is great. I've been working hear for about a month and we have a new chef that's been with the restaurant for about 5 months. So if you have a spare night come in and say hi. maan della nonna is the place to be!